“A sure light every time - rain or shine”. 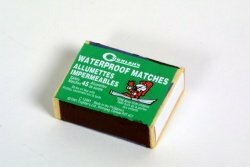 Waterproof striker.Wooden matches with waterproof heads in a 10 pack box. Approximately 40 wooden matches per box.